The great thing about good friends is they tell you about books they are reading, what they are learning and it makes you want to read the same book. 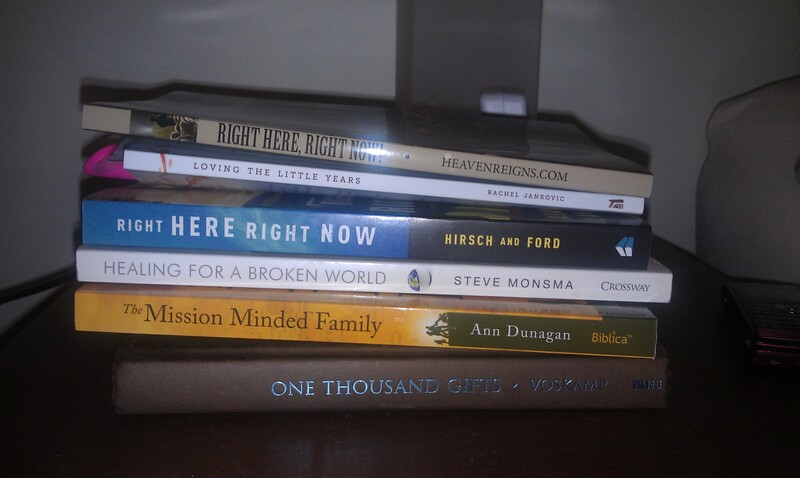 That is how I came to have TWO books titled Right Here, Right Now, on my nightstand. After hearing all my friend was learning from this book I decided I wanted to join in. So I went online, found the book by that title and ordered it. Then I excitedly texted my friend to let her know. Her responding text: The book I mentioned is free. Did you get that one or the other with the same title? Uh, I paid for it. 😦 BUT since the real one was free online I promptly ordered it. Both sound interesting and I paid for one, so I’ll be reading them both. One Thousand Gifts is like the Christian world’s most popular books right now. I actually received it as a gift in March. Started it and then left it behind after a summer vacation. So I’m hoping to finally finish it. The Mission Minded Family is a very practical, easy to apply book on teaching your kids how to look at their world from a more global perspective. I don’t love everything in the book but there’s lots of great ideas. So that’s what I’m reading. Nothing terribly deep and NO FICTION 😦 but still some good stuff. Let me know what you think of the other Right Here, Right Now. I’m always looking for something else to read. I’ve been meaning to get Loving the Little Years and just have forgotten. Sounds good. Love books. Love you!